Building on the fundraising for St. Raphael's Hospice of a couple of years ago, in recent weeks, I have been selling the Worcester Park postcard, door to door, in Worcester Park, in aid of The Children's Trust Tadworth (TCTT). Priced at £1 and thanks to the generous support of Waitrose Worcester Park and a couple of more recent contributions, the production cost of the postcards has been completely paid for, resulting in the entire £1 from each postcard sale going entirely and directly to support TCTT. [Initially the profit from each card had been 32.8p, increasing to 66.4p, and now, with all postcard production costs generously covered, the full £1 goes to TCTT]. I am hoping to gradually visit all the streets surrounding the location surrounding the location of the painting on Sunday afternoons. Residents may wish to be assured that each time, the permission of not only TCTT but Sutton /Epsom & Ewell Council and Sutton/Surrey Police is first obtained and the times and streets provided. So far, the following streets have been visited: Tudor Avenue, Killester Gardens, Sparrow Farm Road, Dundela Gardens, The Mount, St. Clair Draive and Latimer Close. Many thanks to all those residents, who have generously purchased postcards and supported The Children's Trust. Many thanks to Paul and his team, who at Worcester Park Station kiosk, by Christmas Eve, had raised £100 for St. Raphael's Hospice, via postcard sales of Jack Ducker's Worcester Park painting. 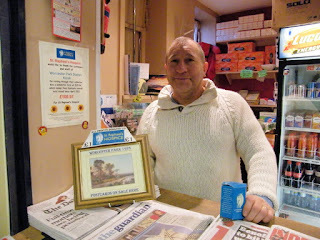 Paul, the proprietor of the newspaper kiosk and cafe at Worcester Park Station has kindly agreed to sell a unique postcard, featuring the 1926 painting of Worcester Park, by Jack Ducker, with all profits from the postcard sales going to support a local charity. These postcards were especially commissioned to raise charitable funds for our local hospice, St. Raphael's. With a kind donation from Waitrose Worcester Park towards the production costs, the cost of each card worked out at 33.6p. Selling for £1 each, the profit of exactly 66.4p per card will be entirely donated to St. Raphaels. It's hoped that the postcards will prove popular with local residents, raising a worthwhile sum for St. Raphael's Hospice. Also, we hope they will shortly be available at other locations in the London Borough of Sutton. The painting and the postcards are featured in an article written by Sophia Sleigh, in this week's (4th October 2012) Sutton Local Guardian [page 10]. 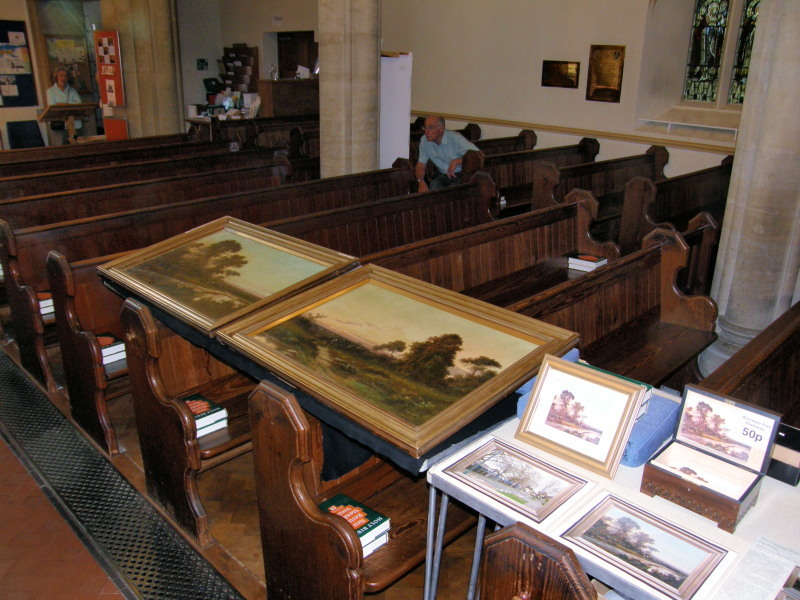 Both the Worcester Park painting and its companion, of Haslemere were on display during Heritage Day, at St. Mary the Virgin, Cuddington. Having identified modern day Sparrow Farm Road as the likely location for the painting, it was interesting to hear the views of residents living along this road. It was particularly intriguing to learn that those properties built on the right-hand side of the road had been constructed on raised concrete beds, in an effort to lift them above an area of land known to periodically flood. One resident showed me a photo from 1935, depicting the flooding of the playground area to the left. Comparing the photo to the painting, it can be seen that the waterlogged natural pond exactly fits with residents’ recollections. This, together with a series of storm drains, now situated exactly where the pond appears in the painting, suggests to me that Sparrow Farm Road is increasingly likely as location painted by the artist. It's Worcester Park life... but not as we know it! Having viewed and photographed the possible locations, consulted local historian and author, David Rymill, approached library staff at Sutton (who were very helpful) and library staff at Ewell (who regrettably were rather less helpful), one location stands out as the likely location for J. M. Ducker's painting: Sparrow Farm Road, KT17 2LW. Today, the area viewed is the edge of suburban Stoneleigh, a housing development which began in the early 1930s. As the artist correctly noted on the rear of the painting, Sparrow Farm Road (then no more than an access track to farm buildings), is on the Epsom Road and on the edge of Worcester Park and modern day Stoneleigh. In 1926, the date of the painting, it was still a farm (note the cattle in the background), but the land was soon to be sold for housing (which possibly accounts for the track in a state of disrepair). [This painting and the above photos are featured in this September's Worcester Park Life magazine (pages7-8), within local historian and author David Rymill's history article. 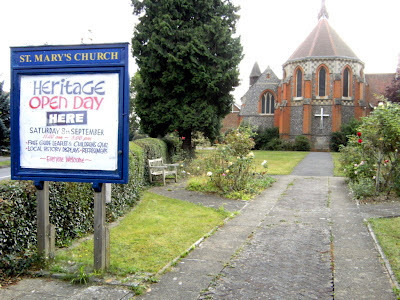 David has also just published his new 300-page book, 'Worcester Park, Old Malden and North Cheam: history at our feet']. 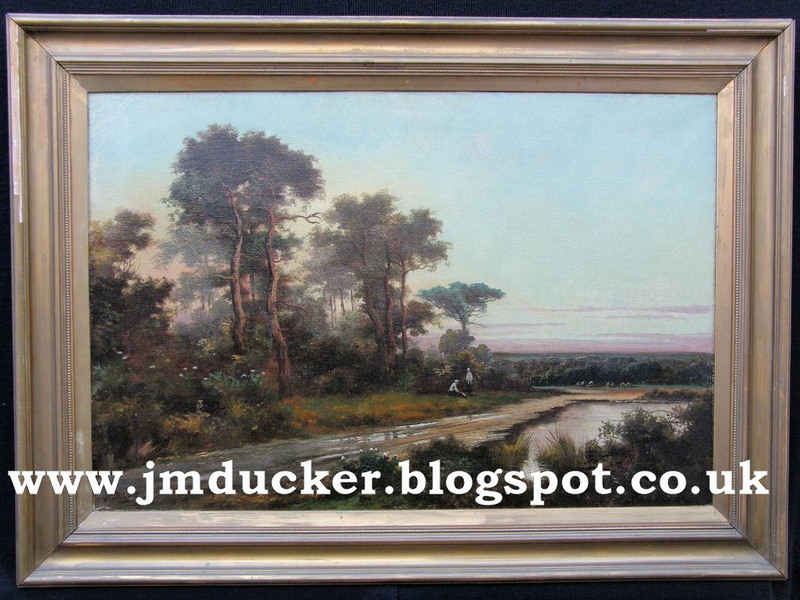 There are many landscape paintings in circulation, signed JM Ducker, most commonly, of rural Surrey and the Scottish Highlands. But for an artist so prolific, actively working less than a century ago, it is both remarkable and mysterious that so little is actually known and recorded about them. Reflecting on this void, one further thought occurred to me: that over time, the chances of rediscovering anything about the artist further diminish, day by day, as the passage of time increases the distance between the artist and ourselves. With this website, I hope to amass any remaining knowledge and records of the artist, by asking visitors to contribute what they know or have learned from off-line sources. Essentially, all that is currently known about the artist is that which has been recorded in the artist’s own hand - within the images of the paintings themselves or handwritten on their reverse. One thing that is already known is that exactly the same scene and location was painted again and again – although sometimes the rear of the paintings were left blank and the scene undisclosed. 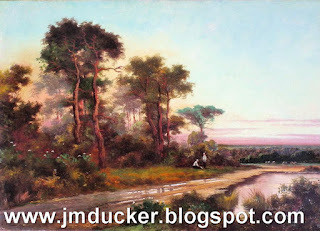 With the rear of some of the paintings left blank, some owners of J M Ducker paintings are unable to identify the location in their painting. 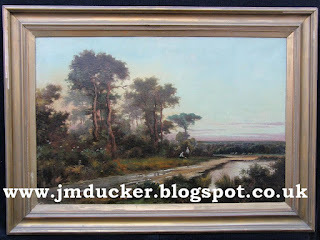 As well as requesting information about the artist, I am requesting that owners upload a photo of their J M Ducker or Jack M Ducker painting(s), and any writing on the rear. Over time, I hope this will produce a database of images by the artist and help identify the locations depicted, where they are unknown. Best wishes, Richard.